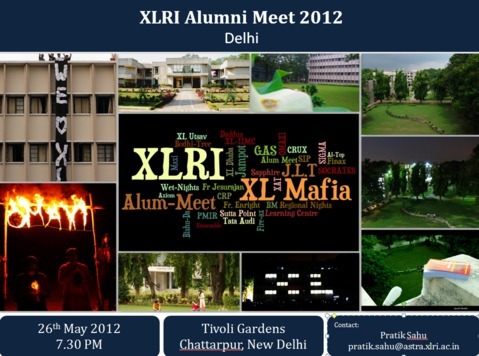 Greetings from XLRI Delhi Alumni Meet team!!! It is the time of the year when XLRI Alumni chapters across the country celebrate the same 'XL Spirit' that glues us all together by organizing alumni summer meets. In the same endeavour we would like to extend a warm welcome to you to join us at the Annual Delhi Alumni Meet on Saturday, 26th May 2012 from 7:30 PM onwards at the Tivoli Gardens, Chattarpur, New Delhi. We seek your support in making this event a huge success. We are also in the process of revamping the Delhi Alumni Chapter and make it the most happening chapter around. In order for us to take this initiative forward , we need you to update us on your current details . Please do join the Delhi Chapter Facebook page too at (FB Delhi Alumni Chapter).